Female horseflies can be problematic as they feed on the blood of mammals while male horseflies typically feed on pollen and nectar. Horseflies are notorious for attacking humans and other mammals. Female horseflies in particular need blood in order to reproduce. Horsefly bites should be taken seriously as horseflies carry other diseases that can be passed on to whoever they attack. Unlike mosquitoes, horseflies rip open the skin to get to the blood. They are able to penetrate clothing or fur, so covering up doesn’t necessarily mean you will be protected. The most obvious symptom of a horsefly bite is pain. The bitten area will feel sore, may turn red and develop into a rash that spreads to other parts of the body. Symptoms include itchiness and swelling in and around the bite area, dizziness, wheezing, and weakness. First, place saliva on the bite. The protein in your saliva will offset the impact of the bite (in exception for the pain). Next, use soap and water, or an antiseptic soap, to clean the affected area. The important part is to properly dry the area to protect against any further infection. A horsefly bite should heal on its own without medical treatment. But there are some measures you will have to endure to speed up the healing process. Horsefly bites can be annoyingly itchy, but don’t scratch the bite area. Not only will this delay the healing time, but it can infect the bite further. To soothe the pain and itchiness, apply a hot towel to the bite. Soak the towel in boiling salt water and then press it gently on the wound for as long as possible. Antihistamine can help reduce the swelling and negate some of the itching. It’s a good idea to cover up the bite with a bandage to keep it protected and prevent yourself from scratching the itch. Other natural means of treating horsefly bites include applying ice packs and/or aloe vera gel to the affected are to reduce swelling and address the pain. If the swelling and redness persists, then you may need to see a doctor. If you recognize some of the symptoms, it may be a good idea to check in with a doctor regardless, just to be sure you’re not experiencing an unexpected reaction. Horseflies tend to breed around marshes, wetlands and in swampy areas. They also enjoy warm climates, so it’s best to protect your skin under these conditions. This can include wearing pants and long sleeve shirts, even if it is hot outside. This won’t necessarily prevent horseflies from biting you, but it can make the bites less likely to happen in the first place. If you live in an area with swarms of horseflies, then you’ll need to purchase insecticides or horsefly traps. Insect repellant is also a good deterrent against horseflies. Safeguard your home by putting in mesh windows. Some believe that garlic supplements produce an odor that keeps horseflies away. Garlic supplements are worth a try if you are going to be exposed to horseflies for long periods of times. 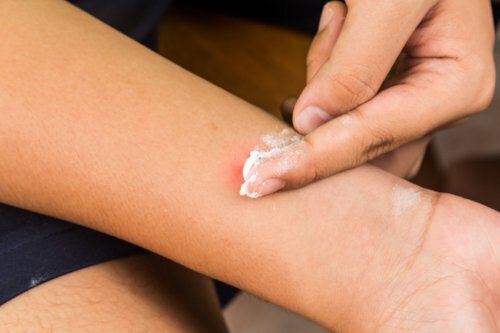 If nothing else, remember that cleaning and covering the bite, applying the correct creams and possibly taking antihistamines should help get you through the pain and itchiness. “Horsefly Bite,” Health Therapy web site, May 26, 2015; http://healththerapy.org/horsefly-bite/. “Insect bites and stings – Symptoms,” NHS Choices web site; http://www.nhs.uk/Conditions/Bites-insect/Pages/Symptoms.aspx, last accessed December 2, 2015. “How to Treat a Horsefly Bite,” eHow web site; http://www.ehow.com/how_4775912_treat-horsefly-bite.html, last accessed December 2, 2015.